The SINUS-220: Quality – Made in Germany. under the sun, providing nearly flawless efficiency measurement of solar cells. The device’s LED technology enables near-perfect solar cell efficiency measurement. Until now, xenon lamps were the standard light source for measuring solar cell performance. But they frequently deviated from standards by as much as 25%. The SINUS-220, however, exhibits a maximum error of only 2%. The 18-color LED-based light source is what makes this exceptional accuracy possible. Xenon-based solar simulators are limited in their precision. They frequently deviate from standards by as much as 25%. In addition, the output spectrum also varies over time by as much as 5% due to effects caused by aging and a lack of monitoring options. LEDs, in contrast, provide the ability to combine a number of different colors in order to represent the full spectrum of the sun as accurately as possible. The SINUS-220 uses 18 different color LEDs. The result is a practically flawless simulation of the sun. The device’s state-of-the-art lens system makes this possible by allowing monitoring even while the measurement is in progress. The integrated spectrometer and photodiode sample the light in one-millisecond intervals. A high-performance control algorithm provides continual self correction. As a result, the spectrum is not only precise, but also stable over time. The SINUS-220’s lens system also perfectly blends colors to ensure that all points on the solar cell receive the exact same spectrum. This uniformity sets it apart from other LED-based solar simulators. Unlike conventional xenon solar simulators, the SINUS-220 allows you to set exposure time to the length you desire. Anything from just a few milliseconds up to continuous illumination is possible. This is especially important for the measurement of high-efficiency solar cells. And last but not least, the SINUS-220 is also especially well-suited for special measurements. Even at lower light intensities, the spectrum remains unchanged. In addition, the user can modify the spectrum practically any way they desire — to create, for instance, blueish sunlight, or even pure red light. Our Light Engine raises the bar for photovoltaic testing. We’ve also set lofty goals for measuring I-V curves. Using an electronic load together with 14-bit technology and calibrated, high-end components is simply a matter of course for us. Choose any number of voltages to specify measurement points anywhere you like — you can even determine the number of current measurements at each measurement point. These and many more features ensure that the I-V curve is measured accurately and with high repeatability. 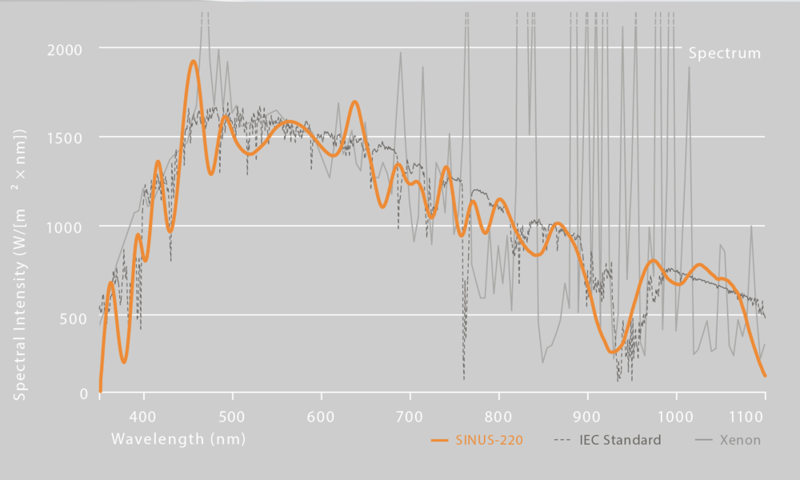 For improved process analysis, the SINUS-220 can optionally provide full integration with infrared and electroluminescence cameras. The IR and EL units are optimized for high-speed measurements and quality analysis on solar cell production lines. Intelligent analysis of infrared images reliably detects hotspots. Electroluminescence imaging helps to assess the quality of materials and establish a correlation with efficiency. The cameras are integrated into the SINUS-220 housing, affording them a high degree of protection. You can easily control the cameras using the SINUS-220’s touchscreen. Equipped with these two cameras, the SINUS-220 gives you a comprehensive final inspection testing system. The SINUS-220 provides you with most critical data from your production lines. We also want our customers to be able to use this data in the way that is most beneficial for them. That’s why the SINUS-220 lets you access and analyze the raw data and use it to send classification criteria back to the SINUS-220 if required. We are of course glad to provide optimized settings and advise you on adapting the system for your specific needs. Complex technology doesn’t have to be complicated to use. That’s why we made usability a top priority in designing our user interface. This translates to a well-organized layout for setting measurement parameters and intuitive touchscreen operation for all features. The SINUS-220 was designed from the ground up to integrate perfectly into any conceivable production line — regardless of whether the line is operational or in the planning stage. That’s why we have chosen very compact dimensions for the Light Engine. The control unit and power supply are housed in practical 19-inch rackmount cases. WAVELAB’s philosophy in developing and selecting components is to achieve the highest possible level of quality. Quality is important since these devices will be subject to extreme conditions including years and years of 24-hour, seven-day-a-week operation. That’s what quality made in Germany is all about. In the event that a lamp does need to be replaced, our product designers have made sure it is a simple process that can be completed in minutes. Only a few simple steps — and no protective gear whatsoever — are required. These characteristics are also a great advantage when using the SINUS-220 at laboratories and certification institutions. In these types of environments, the SINUS-220 is able to replace complex specialized systems thanks to its exceptional precision. For solar module manufacturers, the SINUS-220 is an excellent choice for incoming goods inspection. The precision of the spectrum produced makes it possible to test the efficiency of solar cells of varying qualities without time-consuming recalibration. The international IEC 60904-9 standard provides guidelines for determining photovoltaic efficiency. This standard, however, has not been updated to reflect the changing requirements of a maturing industry. The SINUS-220 was designed to accommodate these changing needs. These qualities make the SINUS-220 one of the few devices currently capable of actually meeting the requirements of the modern photovoltaic industry. The SINUS-220 meets and easily exceeds the criteria for the highest specified class of solar simulator, Class A. INTERESTED? LED’S GET IN TOUCH.